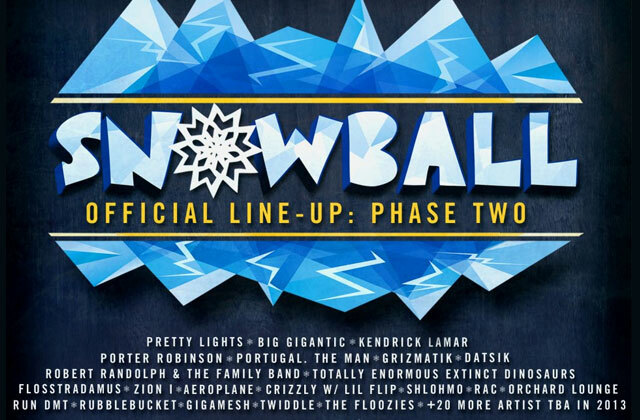 Snowball Music Festival (March 8-10; Winter Park, Colo.) used Christmas morning as an opportunity to reveal several artist additions via the festival’s Facebook page as part of their phase two lineup announcement. Additions include Grizmatik (Gramatik/GRiZ), The Floozies, Shlohmo, Twiddle, Aeroplane, RAC, Robert Randolph & the Family Band, Gigamesh, Orchard Lounge, Run DMT, and Totally Enormous Extinct Dinosaurs. Throughout the paced revealings on the Facebook page, it was noted that the festival would feature a good amount of bands in addition to DJs and producers. These are added to a growing list first announced last week that already includes Big Gigantic, Datsik, Pretty Lights, Flosstradamus, Rubblebucket, Porter Robinson, Crizzly w/ Lil Flip, Kendrick Lamar, Zion I, Portugal. The Man., and more. Organizers say another 20+ artists will be revealed beginning January 1. Three-day GA passes are on sale at a reduced holiday rate of $149. Get tickets and more information on the Snowball event page.